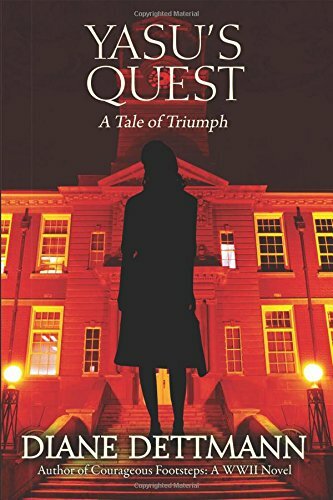 “Yasu's Quest: A Tale of Triumph” by Diane Dettmann follows Yasu on her adventures as she escapes the U.S. internment camps of World War II and flees across the U.S. as a fugitive. It is not only a great coming of age story but more importantly brings to life a part of U.S. history often glossed over in history books. It is both a sequel and conclusion to Diane Dettmann's earlier work, “Courageous Footsteps.” I must admit I haven't read “Courageous Footsteps” but “Yasu's Quest” is written in such a way that you can enjoy it as a standalone novel if you like. Although after reading “Yasu's Quest,” you may want to consider simply reading both. The writing style is simple enough that even the youngest of young adult readers will be able to enjoy it, but it is complex and deep enough to be enjoyed by any age. “Yasu's Quest” does exactly what historical fiction should do in that it raises meaningful issues while simultaneously staying historically accurate. More importantly, this book brings to light real history in a compelling way making it accessible to readers of all ages. Any young readers interested in or currently studying the events of World War II should consider reading “Yasu's Quest” as a way to get a perspective on an often-overlooked part of U.S. history. The story itself is both entertaining and inspiring. Yasu's character is likable from the beginning and you constantly feel both her fear and courage as she struggles against an unfair system that has deemed her and her family as guilty and treated as criminals, regardless of whether or not they are actually guilty. “Yasu's Quest” is a testament to the human spirit, the best and worst America has had to offer, and to the American citizens unjustly imprisoned during the 1940s. It is rare for a piece of historical fiction to be so relevant to today's society, especially when written for a young adult audience. “Yasu's Quest” does not only that, but it also provides a well-written adventure story that also introduces readers to a very dark part of American history. "Yasu's Quest: A Tale of Triumph" is a written triumph. There is no better way to describe a book that functions well on so many levels and be so meaningful. This really is a well-done piece that I think will entertain and inform its readers. If you are considering a historical fiction title to read this is definitely the one. I give “Yasu's Quest: A Tale of Triumph” by Diane Dettmann five out of five stars. The only caveat here is that, as I already mentioned, this is clearly a YA title.